Today we're off to see a bit of Cairo. Our first stop will be the Egyptian Museum, but we are already thoroughly entertained by the ride into the city. We are becoming accustomed to the dust, garbage and squalor of Cairo. We're moving more quickly this time, anyway. No time to get depressed by ugly scenes. We are all cheerfully commenting on what we see. Farms with cabbage patches, sugar cane, date palm and mango trees surrounded by huge, half-completed apartment buildings. We roar in laughter as we see a camel driver and five camels approach the edge of the motorway. Traffic sometimes slows down as we pass a donkey or mule and cart on what could pass as a shoulder. But this motorway has no shoulders, and the road surface, marked as a three-lane highway, has a fluid lane structure. Most of the time five lanes crowd into crooked lanes on the highway. If a car breaks down with a flat tire, it simply stops in the right-most lane, where someone will rush over the wall with tires and service it. The buildings in this city are full of dust, but the cars are spotless. We see men washing their cars as they prepare for departure for somewhere. Some cars along the side of the road are covered in protective cloth covers. We continue along the motorway. There seem to be areas particularly prone to traffic jams. Vendors have set up grass-roofed rest stops here. Sometimes they cross back and forth along the lanes, selling baked goods, balloons or toys for bored children. As we travel, an envelope is passing through the group. Ms. Pouty Lips, of all people, has organized a collection for Mohammed. Peter and I place a large sum of money in the envelope. I check to see how much has been given. I'm impressed. He should be able to live for a while on this. I'm also revising my opinion of Ms. Pouty Lips. What's her real name? Ah, yes - Susanne. And of her doctor partner, whom I overheard giving medical advice to Claudia. She should inhale a handful of sea salt in a liter of boiling water. I'll do the same, I tell myself. Now he's Kurt, no longer Mr. Cool. We cross the Nile - twice, because much of Cairo is situated on a large island. 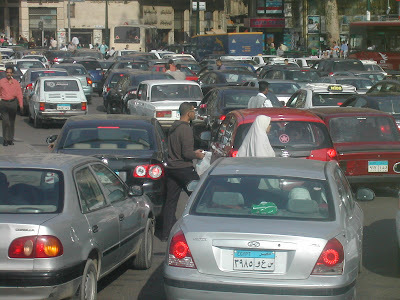 Downtown Cairo looks entirely different from what we've been seeing on the roads on the outskirts of the city. This part of Cairo is modern, with many attractive buildings. The Nile is sparkling in the sunlight, and there is plenty of green along the edges of the river. We arrive at the Egyptian Museum. Mohammed shows us some of its treasures. Without him, we'd be lost in chaos. There are figures everywhere, arranged in some hodge-podge "order", as crowded as the Cairo streets. Some figures are covered in plastic, as workmen build primitive-looking pedestals on which to place them, paint splattered all over the floor. We begin with the Old Kingdom. He shows us some statues in life-like perfection. The lighting is dim, so he shines a flashlight (forbidden) into the eyes of one for a split-second. Life shines through those eyes! How on earth did they do it? How can life shine through lifeless objects? We see wall hangings of beautiful Egyptian geese that used to adorn the palace Nefertiti lived in, still in their original colors. But Mohammed has more, much more to show us. He moves us on a few steps, showing a bas-relief of a funny-looking man who looks more female than male. "That's Amenhotep IV," he says, "the husband of the beautiful Nefertiti you have sitting in a museum in Berlin." Passion is burning in his eyes, but it is not about Nefertiti or stolen art objects in Berlin. He has something much more important to say. Amenhotep, he says, broke with the tradition of all previous generations. He came to believe in one God, the supreme, living God, best symbolized by the sun, whose rays extend into all of creation. This god was already one of the many gods Egyptians worshipped, called "Aten". So strong was his belief in this one God that he changed his name to Akhenaten, which means "living spirit of Aten". This pharaoh was convinced that he was created by Aten and therefore a product of his living spirit. Akhenaten was so assured in his faith and so certain the other gods were false, he did something very bold - he forbade their worship, putting all the priests out of business. The priests were a powerful group of men, and they didn't like this. Akhenaten sensed that he might be pushing things further than was good for him, so he decided to simply move his capital and many followers to another town on the Nile, now known as Amarna, so that this new religion could flourish. Akhenaten wrote a beautiful poem praising Aten, whom he understood to be symbolizing the God of the universe. "Reading this poem," Mohammed says, "You would think you were reading one of the Psalms in the Bible. Some of the language is the very same, praising this God who created the earth and all its creatures. You should read it - it's beautiful!" His eyes are shining. "But this wasn't enough for the priests. They were jealous of this man and his religion, which was attracting more and more followers. They started an uprising and most certainly murdered their pharaoh. They took his name out of the book of the pharaohs, and destroyed his palace. They killed many of the followers of the one God they called 'Aten', and forbade any further worship of this one God, returning their land to polytheism. They forced Akhenaten's son to change his name back to include Amun. He was originally named 'Tutankhaten', 'the living image of Aten', but now his name meant 'the living image of Amun', the name of the most important of their gods. This was the pharaoh we know as Tutankhamun." My heart is pounding. "Living image of Aten"? What does the Bible say about Jesus and all humans? "He is the image of the invisible God", it says in Colossians about Jesus. And what does 2 Corinthians say of the those who understand their connection to God, those of us who have invited Jesus to remove our veils of blindness? "We, who with unveiled faces all reflect the Lord's glory, are being transformed into his likeness with ever-inceasing glory, which comes from the Lord, who is the Spirit." Akhenaten understood this. Mohammed understood this. Muslims aren't supposed to understand, I've been taught. But I know he understands, as do I. Are Akhenaten, Mohammed and I bound together by heresy? No, it is not heresy. Akhenaten's priests didn't understand. I am convinced that it is Truth that is speaking to me, but I'm moving into new territory. Mohammed leads us upstairs. "Meine Damen und Herren, this entire floor shows the treasures found in Tutankhamun's tomb." He lectures for a few minutes and then leaves us alone to explore awhile. He later resumes his tour, leading us to a golden throne. "And this brings us to the end of the tour," he says. Somehow I know that he means, the end of the entire week. We are not finished with our tours for the day, but this one chair is, for him, the climax of the week. I listen carefully. "Tutankhamun was very young when he came to the throne. He had no choice but to obey the priests, at least superficially. But this throne shows what his true belief was." We look at a shining gold throne, depicting the pharaoh and his beautiful wife. "What does this throne show us about his religious belief? Do you see any Egyptian gods depicted on this throne? No - only a gigantic sun, whose rays extend the length of the chair back. No other images at all. 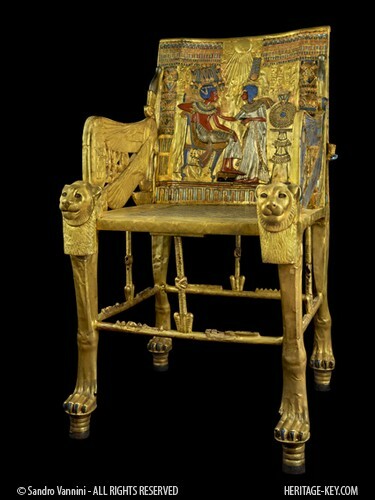 This chair provides evidence that Tutankhamun defied their command, returning to the faith of his father. And that, meine Damen und Herren, is the reason I believe Tutankhamun didn't die of a hunting accident or malaria. He, like his father, was murdered for his belief in the one true God." I leave the museum transfixed, thrilled. I have been in the presence of the living God. I hear the noonday call to prayer. I thank my God for these two courageous pharaohs. We board the bus, bound for the "Alabaster" Mosque, built by Muhammed Ali - not the boxer, but a Pasha of the nineteenth century. I decide to ask Mohammed some more about his faith. "You told us that you pray every day, but you haven't been in a mosque all week. How do you do it? When do you pray?" "I pray whenever I want to, but I also pray every time I hear the call to prayer. I recite some suras from the Koran." "I can choose. I pick those that mean the most to me." He's sounding like a monk in a monastery, but he's dressed just like the rest of us. True believers don't need to wear special clothes to pray. The Egyptian Museum is tucked into one corner of Tahrir Square, the center of the demonstrations in January. We see a tall, modern building next to the museum, scorched by fire. It was Mubarak's party headquarters. Someone set fire to it - either some of his party members to get rid of all the records of their bad deeds, or some revolutionaries. Tahrir Square is very large and it takes quite a while to navigate through all the traffic before we can continue on to the mosque. "What do you think about the Muslim Brotherhood, whom everyone in the West is afraid might win the upcoming elections?" I ask. "We intellectuals are all hoping they won't win. It's hard to say what will happen, but we fear for what could happen if they do win." A true Muslim who shows nothing of the fanatacism of the Islamists. We pass Al Azhar University, where the Imams are trained. He tells us that a group of Muslim theologians from the university went to the Taliban to tell them that it is anti-Islamic to destroy the religious monuments of other religions. Since then, this sort of bombing has ceased. We arrive at the mosque. It is my first time to enter a mosque. It is beautiful, built in the fashion of the "Blue Mosque" in Istanbul, we are told. There are no pews, no statues, no monuments. Mohammed talks a few minutes about Islam and asks for questions. I ask, "How is it that you recite suras when you pray? I never see you reading any books." "I've memorized them," he answers. 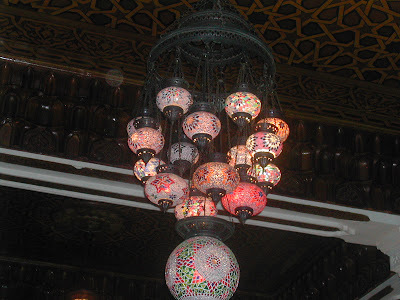 As soon as we turn the corner and enter the souk, I feel a jolt of adrenaline. What is this?! Masses and masses of people crammed into tiny, narrow, covered passageways with shops seemingly piled on top of each other. People crying out everywhere, trying to sell their wares. Colors, movement, sounds all around. 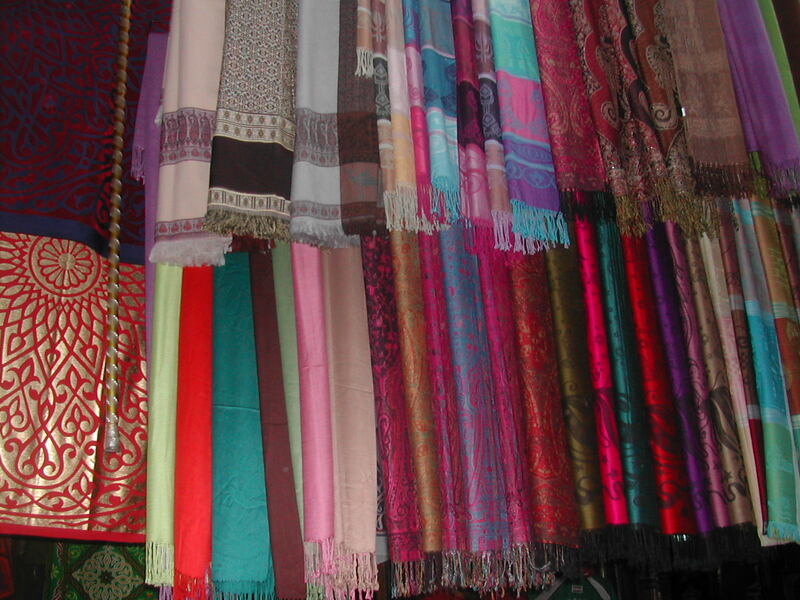 Everywhere I look is so dense with wares, shapes and colors, I hardly know where to look. "Stay close to me," says Mohammed. "Keep your earphones on so you can hear me talk. We don't want anyone to get lost. It's easy to get lost in here." Here is a virtual tour for you. Don't worry - you won't get lost! Peter and I hold each other tightly as we walk and gape. "This is a lot like the souks in Marrakech," he says. I still haven't made it to Marrakech, but now I have it here. I don't think I have ever seen anything so exciting, so compelling, so overflowing with life. Jewelry, lamps, leather hassocks, housewares, antiques, brightly colored scarves, belly dance costumes, lutes and other musical instruments, spices, all crowded, squeezed so compactly there is nothing but color and shape, wherever you look. "We have to come back," I say to Peter. He nods. "We will. I asked Mohammed for his card so we can have him for a private tour." Mohammed leads us further through the souk. My eyes, my body cannot get enough of this. It is like a drug, this market. He leads us to a spice shop. Peter and I buy and buy - cumin, coriander seeds, mint leaves for tea, hibiscus flowers so we can make the tea we had as our first welcome drink, Persian saffron, pistachios. Our time in Cairo is almost at an end, but we never want to leave. One more thing - dinner at a fine restaurant Mohammed has chosen for us. "I think it's a beautiful restaurant. I wonder what you'll all think of it," he says. It is right next to the souk. We walk up a winding stairway into a darkened room full of atmosphere. I'm especially impressed with the brightly colored ornate lamps. A small fountain flows in the corner. We are in the Taj al Sultan restaurant, where we will drink fresh-pressed mango juice as our good-bye drink. Everything we eat will be highlights of the Egyptian cuisine. What atmosphere! it is hushed, yet festive. Peter and I manage to get seats across from Burkhard and Claudia. On my right sits Icicle Eyes. We are warming up to each other, and she says "du" to me. I appreciate her good intentions, but I'm sorry, she's still not a "du" to me. I stubbornly continue with "Sie". Mohammed is over in the corner. The food is wonderful! We have all the usual mezze, but also a variety of stews Egyptians and Moroccans call tagine. Now that she's melting, I can no longer call Astrid Icicle Eyes. She tells me about her Iranian friend, and how she happened to become friends with an Iranian. I realize that if she and her husband friend with Muslims, they can't be as callous as they first seemed to me. Noreen, when will you ever learn? We talk about our common profession - teaching English. Over in the corner, I hear intermittent coughing. Mohammed is having a hard time. He's been talking all week. He shouldn't smoke, I think. I continue eating and talking to Astrid. Mohammed coughs again, but this time he doesn't stop. On and on he coughs, violently, urgently. His face is as red as his shirt. He's surrounded by members of our tour group, but nobody's helping him. Can't they see he's in trouble? Somebody help Mohammed! Please! I scream silently. No one budges. It's as though they were all frozen to their chairs. Is this stiff German propriety? Or don't they see? Don't they care? I run over to him. My face is probably as crimson as his, but I don't care what they think. Mohammed needs help, and I'll help him, no matter what anybody says or thinks. I begin to pound his back. "Harder!" he manages to croak. "Do you have food caught?" He nods. I pound as hard as I can. The coughing eases somewhat, and he lifts his hand. The food particle is dislodged. I return to my seat. All eyes are on me, but no one says a word. "That's my Noreen, a sister always ready for the rescue," says Peter. His words lighten the tension, and we all resume eating. Just as we prepare to leave the restaurant, Susanne stands up and gives a small speech, thanking Mohammed for the superb job he's done guiding us around. She hands him the envelope. Yes! Thank you Susanne, too, for taking this into your hands. It's dark. It's getting late. Our bus takes us back to the hotel. "We will soon be parting," says Mohammed to the group. "Someone will be meeting you all tomorrow to take you to the airport, but I'll be leaving you as soon as we return this evening. But before we part, I have a present for each of you." He hands out CDs of Egyptian music and a DVDs about Egypt. The CD contains the music we heard on the bus when traveling through the desert, and some Mohamed Mounir. The DVD shows everything we've seen this week. We arrive at the hotel. Time to say good-bye. One after another, people walk up to Mohammed, shaking his hand as they thank him. Peter and I are almost the last ones. I shake his hand, and then he surprises me. He bends over and brushes my cheek with a kiss. "Auf Wiedersehen," he says, and turns to the next person, as we leave for our room. Note: Although this post concludes the organized part of the tour, I am not quite finished with this series. Stay tuned. There will be one or two more postings in "Shukran" means "Thank you".